John Goodrich and Mike Tober. Photo by Bob Suh. If you love precision in comic timing and splendid historical style (and who doesn’t? ), then The Metromaniacs from Theatre in the Round Players is a show you don’t want to miss. 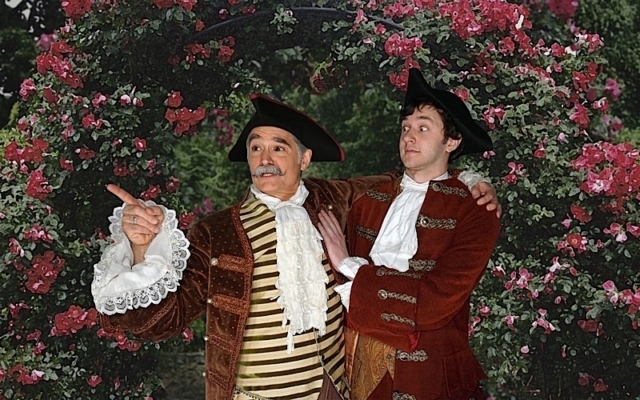 Adapted by David Ives from the zany 1738 farce, La Metromanie by Alexis Piron (1689-1773), this comedy of mistaken identities has been directed with stylish flair and fabulous flourish by Kari Steinbach. Her actors are totally in sync with the pre-Revolutionary French atmosphere as they deftly flicker from hilarious scene to hilarious scene to hilarious scene. It is convoluted as all get out, but who cares! It is enormously entertaining fun! Moreover, TRP’s The Metromaniacs is one of the best spoken verse productions in the Twin Cities of recent years. The pretentiousness of the Paris salon scene where poetry pervades is spoofed with swift contemporary references that glisten at points throughout. Nonetheless, the Enlightenment Age sensibility never flags. We are always transported to that elegant space in time with the design team brilliantly eliciting that as much as the wonderful actors: Devyn Becker’s spare but lovely set, Deb Murphy’s sumptuous costumes, and props by Tyler Lanam. Mistaken identities run rampant with Mike Tober in a first-rate lead performance as Damis, a young poet mystified by a mysterious poetess. At his side is Mondor, his valet (a masterfully mischievous Derek Dirlam)—a delicious example of a lower figure on the social ladder, getting the best of his betters. If this little gem of a play has any deep message, it is the ineptitude of the aristocrats vs. the savvy of the lower rung. Adam Gauger brings charmingly wholesome naivete to Dorante, smitten with Lucille (a stately Jane Catherine Sterk). Autumn Sisson delights as Lucille’s maid, Lisette. John Goodrich and Rick Lamers are hilarious as the well bred older patriarchs on board this comedic rollercoaster ride. All is nicely enhanced by Bill Larsen’s lighting and Robert Hoffman’s sound design. And to top it all off, there’s a queer element that spins out of this delightful chaos but I can’t tell you what it is without spoiling the outcome. So you’ll have to go to see it at TRP. It’s the most vibrant two hours traffic on any local stage. Definitely worth it. Lot’s of laugh-out-loud moments, and so many twists and turns, your head will spin.